‘My whole feeling is that my paint is part of the story of decorating a home. I am a painter, an artist, that’s my background and that’s who I am.’ Creating her famous chalk paint in 1990, 25 years later Annie Sloan has a network of 1,500 handpicked stockists, 25 books on paints and painting techniques and a name anyone who is anyone in the painting and decorating world would recognise. Therefore I was thrilled when Annie took the time out of her undeniably jam packed schedule to sit down and chat to me about her career. 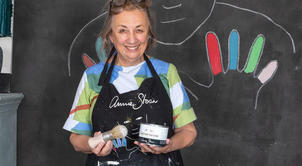 Down to earth, funny and incredibly passionate, it becomes clear to me that Annie’s brand is, quite literally, what it says on the tin – a part of the woman who created it. So Annie, how did you get to where you are today, where did your passion for the industry come from? It started with art school where I did fine art. I then did a bit of journalism and didn’t really know where I was going, but I knew one thing I wanted was to stay within paint because I really loved it. I started learning more and more about paint and got more involved in the subject. I was interested in people’s motivation to paint, despite the lack of tuition at school. I started doing work for people and making my own paint, which was completely different to all those on the market. That was 25 years ago now! In the meantime I’ve always been teaching, I’ve taught painting for years which I’ve always loved and learnt from. Where did the inspiration for your books first come from? Well in that time I got really interested in the whole history of paint – why in some countries do people paint more than others? What if you were a farmer living in the 1800’s? People would make their own paints out of really simple things like milk, eggs and the local earth pigments and then later on more manufactured paints came. I’d be trying to write a book for a while and as soon as I dropped it, someone wanted to publish it. I’ve written 25 books in 25 years – I’ve been quite busy! You could say that! So what is your favourite part of your undoubtedly hectic job? Oh gosh, I don’t know! It’s really hard because you know when they say be careful what you wish for, well everything I’ve got it what I’ve wished for really. I do love painting and decorating and designing; I don’t get enough time to do that now, but I make myself and often work at the weekends to fit this in. I also love the way all my stockists work together. My structure for that is really special because we work together – I support them and they support me and that’s how we’ve grown so well. Am I right in saying you only sell to independent shops? Yes, this is something we have to fight for now because the big shops like B&Q are competing. They’ve all got their own so-called ‘chalky paint’ – it’s nothing like my paint, so I’ve really got to fight for that and make my own name bigger. As your team has grown do you still have control in your paints and products? Oh god yeah, completely and utterly – I live and breathe it I really do. I work a lot of hours and I love it – it’s my baby and you don’t give your baby over to somebody else. I’m involved in a lot of the areas; they have to fight me off really! How does it feel to see your paints in the shops and your books on the shelves? Oh it’s lovely! It’s taken a while but every now and again something little happens and you think bloody hell that’s amazing! But I think I’m fairly grounded and I’m always aware that pride comes before a fool, so I’m long in the tooth now and I know not to start counting my chickens. I’m always on guard and I don’t get to proud, or I try not to! Can you tell us a bit more about your courses and your teaching? Well first of all you don’t have to go on a workshop to learn any of my techniques, you could pick up a book and start paining. But, going on a workshop will teach you a lot more, it will give you information about colour combinations and style. I think people learn best by watching. There’s also the camaraderie of learning in a group of people and that’s really nice, they give you ideas and a lot of confidence. I think there’s just that feeling of being inspired on a course. I wish there was another word for inspiration because there’s nothing like it when you suddenly realise what that means. That’s such a great answer – thanks Annie! Going into the New Year, what is next for you and your brand? What I want to do is try and make my stockists even better than they are. I call myself Annie Sloan home, I’m not just paint. My whole feeling is my paint is part of the story of decorating a home, I am basically a painter, an artist, that’s my background and that’s who I am, but I don’t see that you decorate your home with just that. I’ve got fabrics and all sorts coming out next year, I can’t tell you much, but loads of exciting things. Exciting! Best of luck with it all! Where do you draw your inspiration from when decorating a room? If you are decorating your own home, personal style is really important. It also depends if you are looking at the room in isolation from the rest of the house, or what you are trying to do with colours. If you are a keen on pales and neutrals, I might do lots of pales and neutrals, but then maybe add a little bit of colour to inject a bit of life into it – like a broach on a plain black dress. My last question then, what is Annie Sloan’s house like? Well I’ve got a Victorian house in Oxford which has got some quite fancy, oh what do you call that bit around the top of the room – the cornice! So it’s quite a pretty house. Those rooms are a bit more formal, a little bit grander. At the back we’ve got an extension which is the garden room and that is a little bit more modern. I’ve got a way to mix both designs, both styles of things. Also because I was at art school I’ve got a bit of a boho thing going on – interesting little pieces I’ve collected. Of course I go for colour quite a lot as well, especially in the more modern bit, I’ve got a graphite wall and a bright red cupboard, but the other rooms are a bit more white and neutral. Anyway, it’s a mix! If you are ready to take your first steps into the painting and decorating industry, why not learn the tricks of the trade from an expert? With plenty of courses to choose from, roll up your sleeves and get creative!